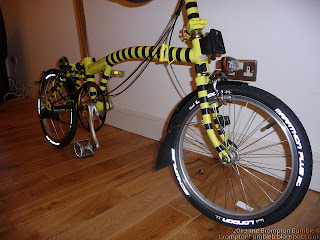 Well after the IG London Nocturne it was time to revert Bumble B into "Commuting Mode". I thought I'd put on the new Marathon Plus: London Edition I got awhile ago & ofcourse the mudguards. Going to need them at this time of year with the weather we have in the UK. What a battle that was ! Getting the race tires off was easy, getting the new tires on was hell and then some. Because they are new they are pretty tight to go on. 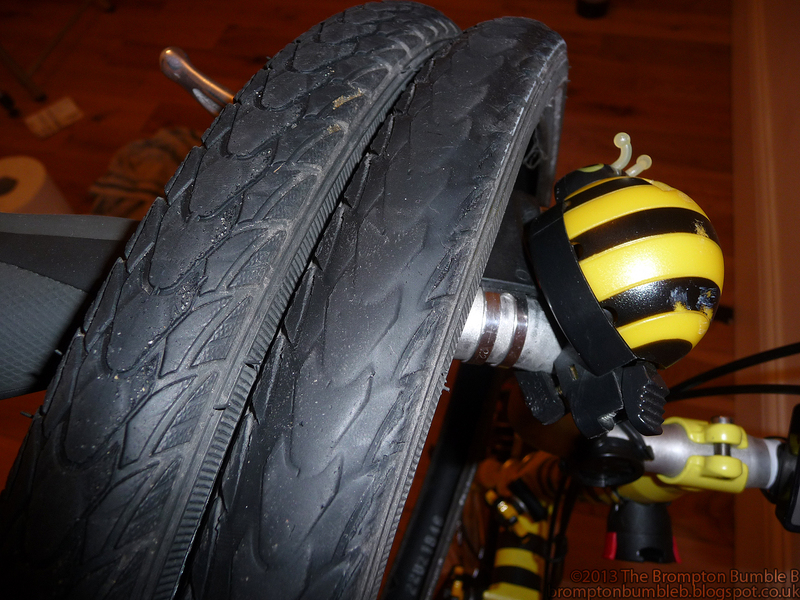 I had to in the end use the "Zip-Tie" trick to get them on, basically get as much of the tire onto the wheel as possible then zip tie the tire to the wheel tightly and squeeze the tire around till I finally got it all on. Got it all done but then I looked at the rear wheel's pressure value was not lined up straight and I made the mistake of not letting the air out before moving the value to be straighter. 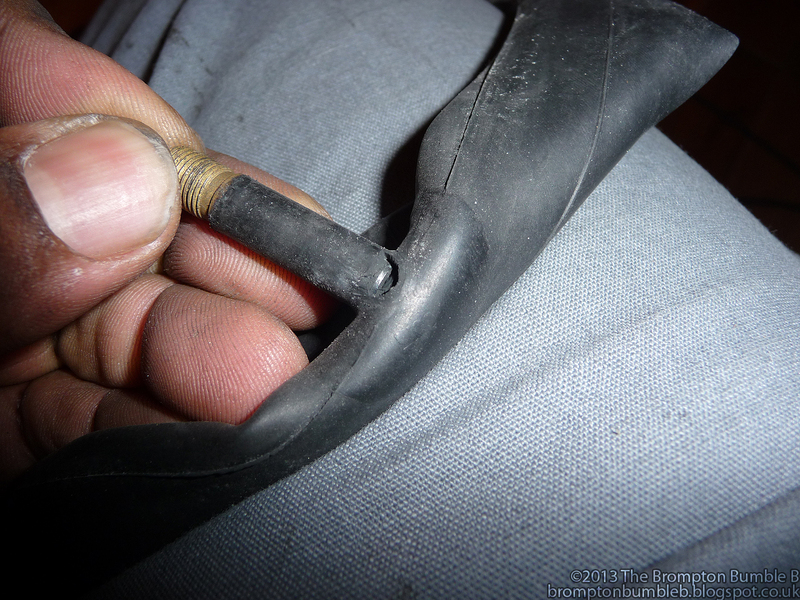 With the pressure of the tube I punctured the inner tube right next to the value so had to install a brand new tube. As you can see in the above photo the rear tire wears out ALOT faster than the front tire. 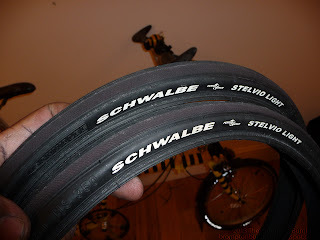 I had these tires put on at the same time and look at the difference. My RED tinted racing tires. 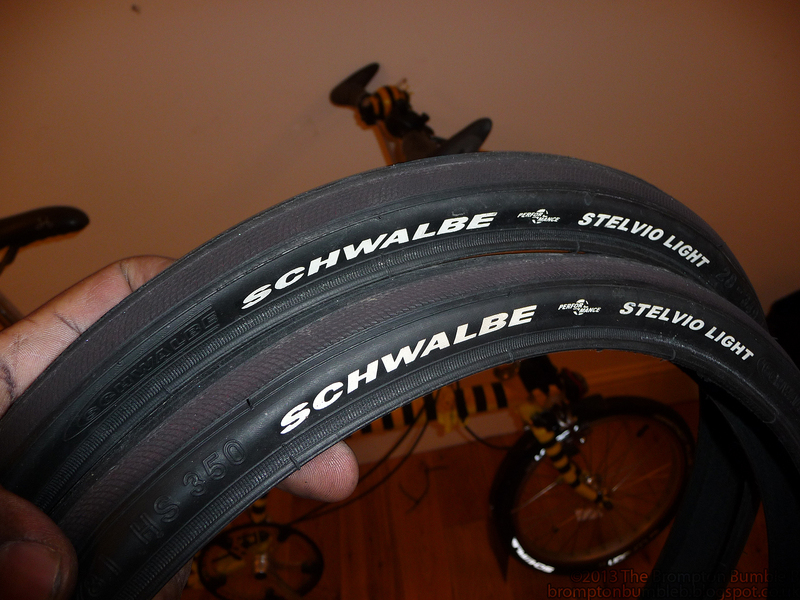 I noticed after racing at the IG London Nocturne that the right side of my Schwalbe Stelvio Light racing tires had a reddish tint to it. The track was basically right turns all the time. On the track they had to put down some special extra grip for the riders to be able to go round the corners safely. Even so there was a few bad tumbles but not in the folding bike race or any of the members of the London Brompton Club. For all those that did have a tumble I hope you recover quickly. I've found that when the rear tire needs replacing I move the front tire to the rear and put a new one on the front. You get the full life out of the tires.